Deformation and fluid interactions are important catalysts for metamorphism. However, the exact nature and feedbacks between syndeformational metamorphism and metasomatism remains poorly constrained and has important implications for the behavior of currently deforming crust within inaccessible portions of the earth. I have several projects under way that investigate strain localization, metamorphism, and fluid flow at various scales from the cm to the km. ​​Understanding the spacio-temporal patterns of deformation and metamorphism during a collisional event yield valuable constraints on orogen growth, geometry and scale. Because many ancient orogens are deeply eroded, we are often limited in our investigations to the deep crustal metamorphic roots of mountain belts. The 1.8-1.7 Ga Big Sky Orogen (SW Montana) is one such example of a deeply eroded and poorly exposed collisional orogen. New structural, geochronologic, and petrologic data, when placed within the regional framework of timing, magnitude of deformation, and metamorphism reveal a pattern of foreland-directed propagation of high-grade thermotectonism across the orogen. This is a similar pattern and magnitude to that which has been observed in other major collisional orogens throughout geologic history (Condit et al., 2015, Lithosphere). Top: Plot of P and S wave anisotropy versus amphibole mode. Middle and bottom: lower hemisphere velocity plots for P and S waves calculated from elastic tensors (created with EBSD data) for two amphibole rich deep crustal shear zones. 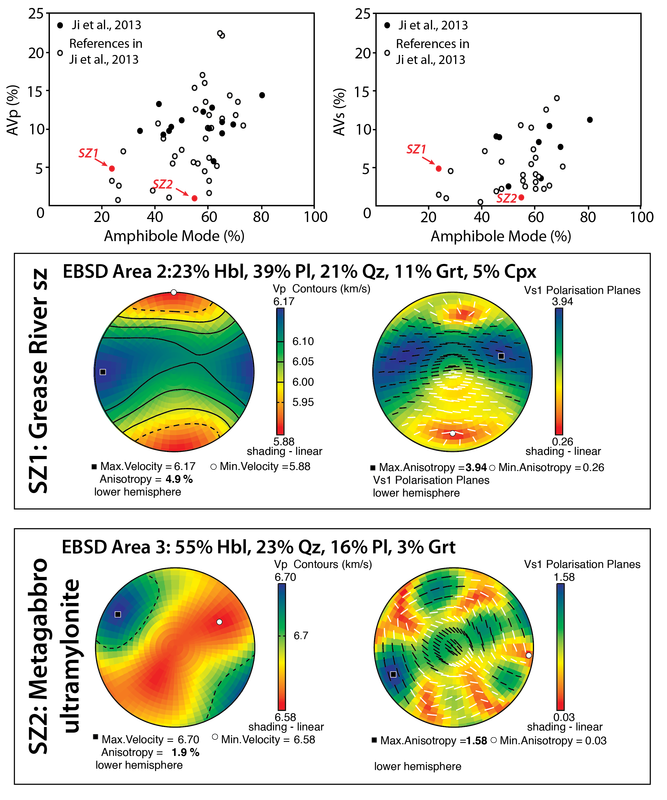 Seismic anisotropy, the directional differences in seismic wave velocity through a medium, is a powerful tool for mapping and identifying inaccessible structures and processes at depth. Within the deep crust, alignment of mineral crystal lattices (strong LPO/CPOs) during deformation or metamorphic phase growth can create strong seismic anisotropy signals within localized high strain zones or areas of pervasive fabric development. 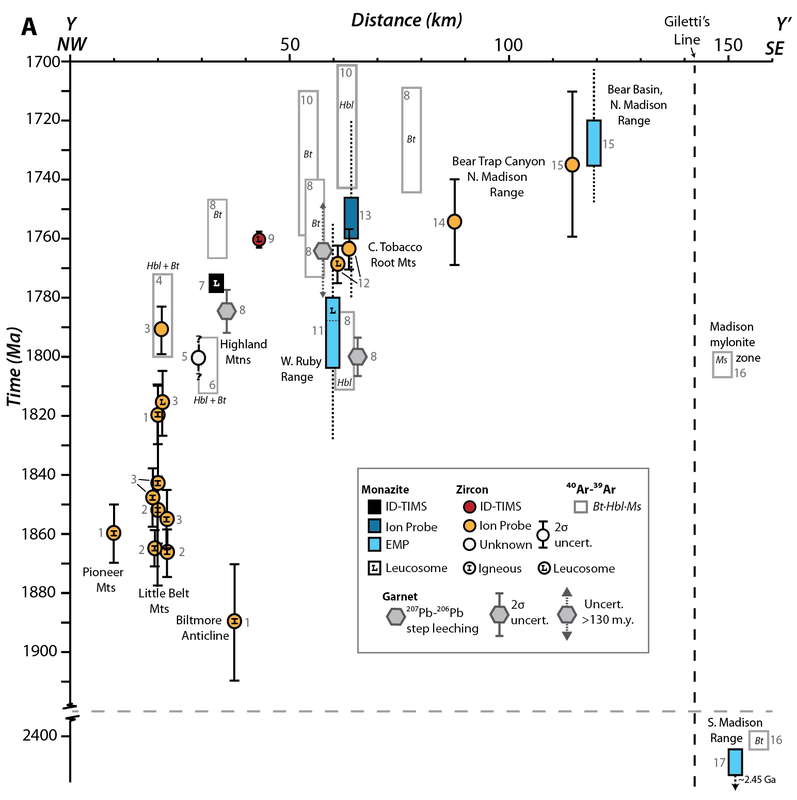 The strength of these anisotropic signals are intimately linked to the production of CPOs (crystallographic preferred orientations), within key anisotropic minerals. In turn, CPO strength is due to the active deformation mechanisms. Thus, detailed studies of deformation mechanisms can be directly linked to the strength of seismic anisotropy. A component of my current research is focused on constraining the production of CPOs (and thus anisotropy) in amphibole rich tectonites. 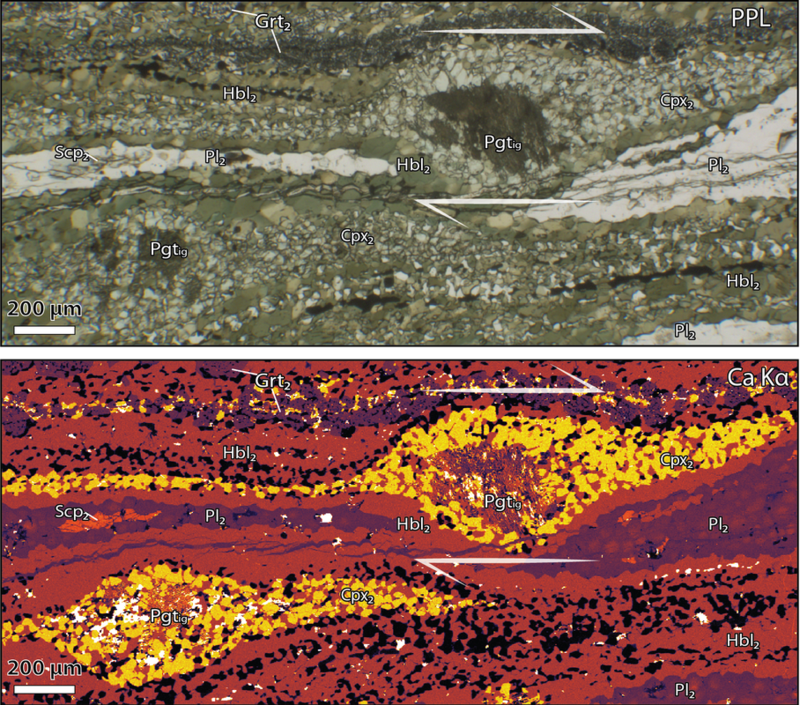 This is done through a combination of detailed microstructural and EBSD work on natural amphibole rich lower crustal shear zones, and an experimental approach (Condit et al., ​in prep).